1. Collect five Colgate® toothpaste tubes. Clean them by cutting off the bottom and slipping your scissors into the side seam. Flatten them out and clean with soap and water. 2. Cut four tubes to 3½” x 4½” and one tube into a 3½” x 3½” square. Fold down the top ½” of the four rectangular tubes and tape. 3. Take one of the four rectangles and punch holes every ½” along the two tall sides and along the short bottom side that is not folded. Use this punched piece as a template and punch holes in the exact same spots on the other three rectangular pieces. 4. To punch the small square piece, line up the short punched side of the rectangle piece with any side of the short piece. Repeat punching holes for the other three sides of the square using the short side of the rectangular piece as a template. 5. Then punch two holes near the center of the square. This will be the bottom of the container and the holes will be for drainage. 6. Match up two large pieces and lace up one side tying it off at the top and bottom. Open it up. On one of the non-laced ends, attach to the next rectangular piece in the same way with the printed sides facing out. Repeat for each additional rectangular piece. When you have laced all four pieces, connect the two end pieces together and lace creating a cube with your pieces. 7. Match up the square piece with the bottom of the container. Use binder clips to hold it in place. Lace around the bottom of the container and tie it off. You are ready to put your upcycled toothbrush holder into action. 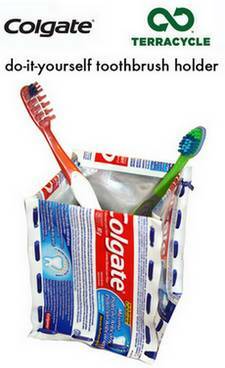 Check out our blog entry on the Colgate® and TerraCycle Recycling Program to find out how you and your non-profit organization can earn money from sending in your old toothbrushes, toothpaste tubes, and packaging.